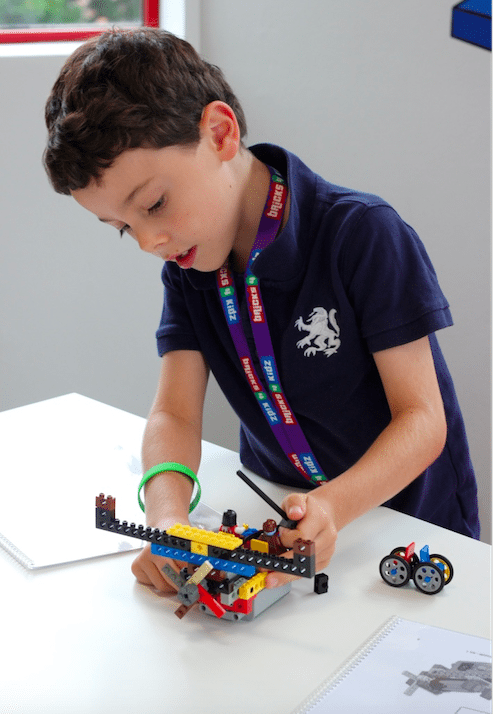 It is a system the combines both SCIENTIFIC and ARTISTIC EXPLORATION to harness curiosityKids already know how to build with LEGO® bricks, but with a little coaching they can learn engineering, architecture and concepts of physics and mathematics using the plastic components. AND playing with LEGO® is FUN! How is Bricks 4 Kidz® different from other LEGO® programs? At Bricks 4 Kidz, we learn, we build, and we play with LEGO® Bricks! We use LEGO® products to provide a fun, hands-on learning and building experience focused on STEM concepts. So how is Bricks 4 Kidz® (B4K) different from other LEGO® programs? B4K has its own proprietary “Project Kits.” These B4K kits consist of specific LEGO® Bricks and Technic elements in specific quantities, and specially sorted. B4K has its own proprietary “Model Plans.” B4K Model Plans are NOT the equivalent to LEGO® instruction manuals that you buy at the store. You cannot purchase B4K kits or model plans at a store or online. B4K offers a variety of programs, including After-School Enrichment Classes, In-School Workshops, Camps, Birthday Parties, Kidz Night Out, and Pre-School Classes. All of the B4K programs mentioned above are available year-round, and can bemodified to fit the particular needs of different schools, institutions, communityorganizations, or other locations. Because B4K instructors teach year-round, they are able to consistently offer a varietyof fun and educational programs to fit parents’ needs and children’s desires. B4K curriculum ranges on a “Fun-to-Learning” spectrum. This means some programs are geared more toward creative free-build and involve exciting pop-culture themed models and activities. Other programs are more learning-intensive, offering a more educationally focused experience that incorporates concept of STEM and architecture. B4K is a franchise organization. B4K franchises are located in over 35 countries around the world. B4K corporate offers full-time, on-going support to all B4K franchises. The curriculum is uniform for all B4K franchises, with flexibility to allow franchises to adapt programs to meet the desires of each location’s customers: parents, schools, and most importantly…the children! All B4K franchises undergo extensive training before operating independently. B4K corporate is motivated by the passion to teach children and make learning fun! The success of B4K as a whole depends on the success of each franchise. Excellent teamwork and support enables B4K to continue to grow each year, giving more and more children opportunities to learn concepts of STEM and have a blast building and playing with LEGO®! B4K has been teaching architecture and engineering to children since 2008. The same students continue to participate in B4K programs year after year!